China’s efforts to project power westwards are meeting resistance from local Muslims. A sign of problems to come? While the international media has extensively analyzed the demonstrations and street clashes in Turkey, Brazil and Egypt over the last several weeks, there has been very little coverage of the street violence happening in China’s Xinjiang Uyghur Autonomous Region (aka East Turkistan). 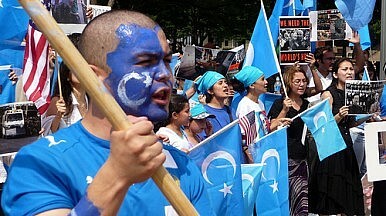 The Xinjiang violence has not been as impressive in terms of numbers of protestors and certainly offers less photographic and video documentation to make its story compelling than these other, sexier street battles of this summer of discontent, but what is happening in China’s northwest may be no less significant to future geopolitics. On the surface, the latest outbreaks of violence in Xinjiang do not appear remarkable. The first incident on June 27 involved “sixteen knife-wielding religious extremists” attacking a police station and a construction site near the northern city of Turpan. A second incident occurred on June 29 near the southern city of Hotan, and allegedly involved more than 100 motorcyclists – also armed with knives – storming a police station. While there is still little information about casualties in Hotan, official reports claim that the violence near Turpan resulted in 35 deaths. This is the highest death toll of any instance of civil unrest in Xinjiang in the last four years, but on its own this number of casualties in the most populous country on Earth is only marginally newsworthy. However, the heavy-handed state response to this recent violence suggests that it is much more significant than is readily apparent. It has triggered a mass mobilization of military and security forces in the region and a variety of new restrictions on ethnic Uyghurs. Part of the significance of these recent acts of violence is that they reflect a continuation and potential expansion of ongoing ethnic tension in the region that China has struggled to mitigate. Similar acts of violence have occurred periodically in Xinjiang over the last two decades and increasingly so in the four years since the events of July 5, 2009, when brutal ethnic violence engulfed the region’s capital city of Urumqi. The 2009 events left close to 200 dead and resulted in extensive property damage, hundreds of arrests and missing persons. It also led to the discontinuation of Internet service to the region for an entire year and increased surveillance and restrictions on ethnic Uyghurs. In this context, the recent violence suggests that the People’s Republic has serious problems in a region where it intends to base much of its future economic growth. Beijing portrays this ongoing violence as a widespread terrorist threat fueled by external support from Islamic jihadists. In fact, the state claims Uyghur terrorists who have trained and fought in Syria’s civil war carried out the most recent violence near Turpan and Hotan. The level of sophistication in the attacks we have seen in Xinjiang does not, however, resemble the work of groups with international jihadist support. Others view the violence happening in Xinjiang as a local response to human rights abuses, which are undoubtedly rampant in the region.